Click on this link for Schematic, this link for model file. 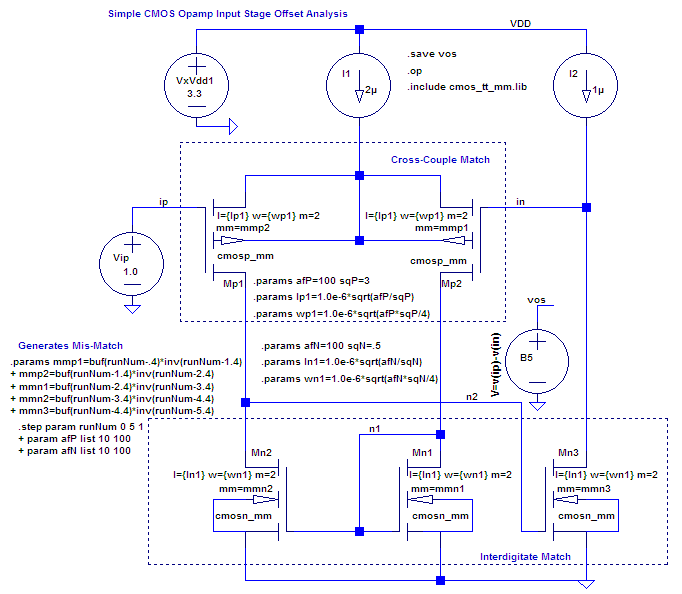 The simulation schematic, coded in LtcSpiceIV, showed a simple CMOS opamp input stage. 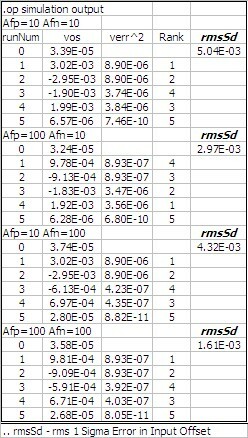 The LtcSpice buf and inv functions are used to created a 1 sigma RMS mis-match table show below. The parameter ".step" function is used to generated nested loops that evaluate offset vs device gate area. ... note the LtcSpiceIV database for this example can be obtained without charge via email request. This example demonstrates the application of RMS statistical analysis to input offset of a simple Opamp. The schematic shows the basic structure for a 4 MOSFET transconductance input stage(Input differential pair followed by current mirror). Re-calculating Afn for the required total offset yields an area factor of 40.